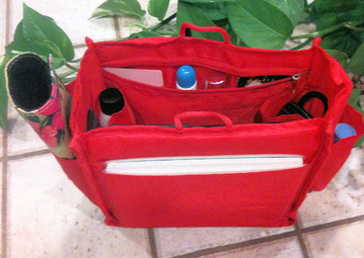 The ORIGINAL Base Shaping, Lightweight, Quick Change Purse Organizer! We designed a product to make one area of your life a LOT easier! Would you like to change your purse every time you change your outfit with no hassle? Are you always digging around in your purse looking for things and then realize you left it in your other purse? Worried about protecting that beautiful handbag you just bought? You'll want to keep a Chameleon in your purse ALL THE TIME. 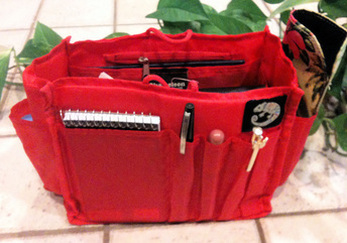 This handy purse organizer insert will be like the lining in your purse. It has just about all the pockets you'll need and will slide right down into your handbag and helps to protect the interior. Keep everything in your purse organized and simply lift it out with all your things intact whenever you need to drop it into the next bag, tote, backpack, briefcase, diaper bag, car console - anywhere! We Can Organize Any Size Purse! ​10" x 5" x 6.5"
​12" x 6" x 7"
​11" x 3" x 10"
Washable - delicate cycle, air dry.